No Artificial Sweeteners, 1g Sugar, Antioxidant Infused Beverage contains 4 different super-fruit charged water flavors: Sumatra Dragonfruit, Costa Rica Clementine, Brasilia Blueberry, Malawi Mango. These flavors are inspired by the tropical places where many of the super-fruits are found. Each 16 oz bottle contains 2 servings and only 10 calories (5 per serving), 2 grams of sugar (1 per serving) and 70 milligrams of caffeine (35 mg per serving). This caffeine comes from antioxidant-rich coffee fruit extract & white tea extract. A whole bottle would be the rough caffeine equivalent of drinking two cups of green tea. Along with the energy boost these drinks provide, they are rich in other antioxidants, come in BPA-free bottle and contain no artificial sweeteners. They are, instead, sweetened with Erythritol which is a sugar alcohol derived from lichens and algae. Each flavor is also certified kosher, gluten-free, soy-free. GMO-free and vegan making them a good choice for many dietary needs and allergy concerns. 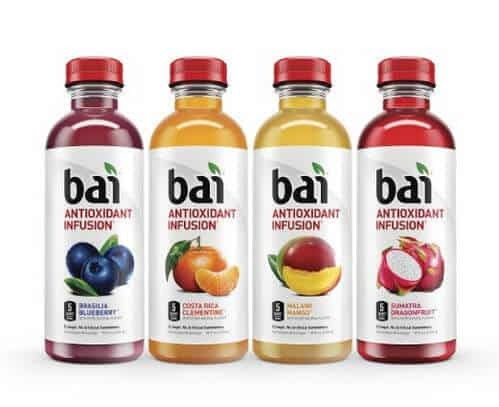 Bai drinks fill a need for flavored water that is not sweetened with anything artificial while still having some kind of sweetness provided by erythritol. Too often other, similar drinks will use questionable sweeteners or not have any at all which can be fairly bland to many palates. Other reviewers found it not sweet or flavored enough and over-priced for what you’re getting. This is definitely a product you will want to try a few bottles of before ordering a massive amount even though the majority of reviews were positive. Are Rice Krispies Gluten Free?